Opry an Iúir returns on TG4 on Wednesday 2nd November to 31st December 2016 at 10.30pm for series 5 with a very special line up. 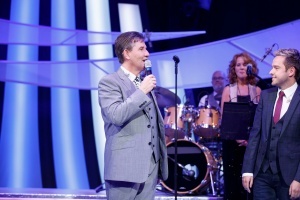 Hosted by the King of country music, Daniel O'Donnell and joined by Lynette Fay, they meet and perform with some of the biggest stars of country music. Series 5 showcases some very special artists each with their own show: Trudi Lalor, The Three Amigos, T.R. Dallas, Derek Ryan, The High Kings, Clíona Hagan together with Michael English, and a very special Opry with the Stars episode!